Setup Assistant provides Salesforce Administrators a centralized tool for configuring their orgs, products, and features. 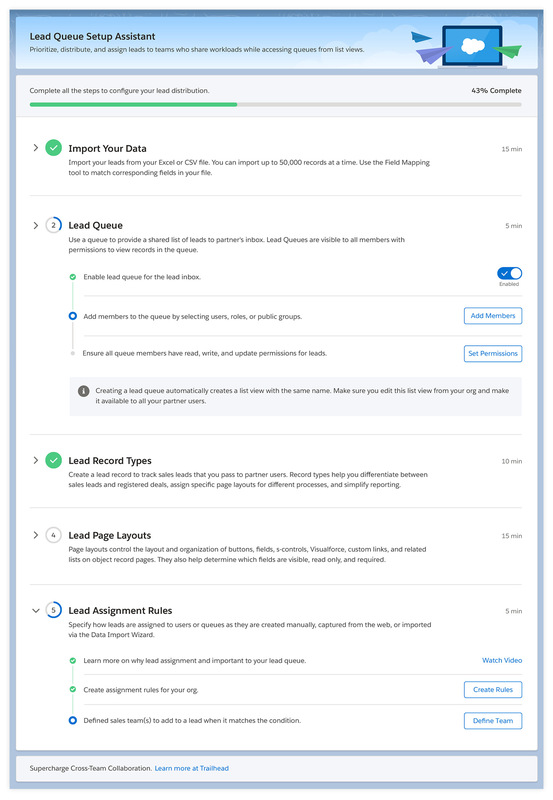 The Assistant lives within the Setup experience which typically contains hundreds of pages, making the Assistant a critical feature for easy onboarding. The ability to track and manage each step was key since each step could take minutes to hours, and days to weeks to complete all the steps. As Product Design Lead for Setup Experience on Platform UX it was critical to identify and collaborate with all the various product and cloud teams who would be utilizing the Assistant. Helping in this effort was Kruti, a Senior Designer partnered with me. Her insights into the legacy use cases, the technology stack, and well as providing general design feedback added much needed value. We were able to identify over 15 different product teams, over 40 stakeholders, so coordination and process would be key. We implemented an outreach program, interviews, brainstorming sessions, stakeholder meetings, development and design reviews. We leveraged existing research for onboarding experiences as well as conducting our own interviews and usability studies with Administrators at Dreamforce, Salesforce's largest event. After the many weeks ideation, research, design, and reviews with Accessibility and Design System Teams, the design for the Setup Assistant was complete. The last steps were for me to write the design guidelines for the Assistant, followed by working with the UX Engineering team to have the feature added as an official Lightning Design System component, which is where it lives today.